In this loud and fast-paced world, many introverts find themselves drowned out overwhelmed or stomped on by society. Here are 6 reasons to look for an introvert as a life partner. The first thing you need to know is that introverts do not need you, they do not need relationships and they don't need others, they don't need them, they want them. So, if an introvert chooses you they want you. They want someone so much more powerful than to need them. Needing someone means that once that need is met the person is no longer necessary to want someone. However, this means that there's a conscious effort to keep that person in your life. Introverts know what it's like to be ignored and overlooked. So, when you talk to them, you will have their full attention for you to want to talk to them. Whether to know their opinions or not, means the world. If they reply, they will have given the response a lot of thought. They won't take your discussion lightly and you may soon find that they know much more about you than you do about them. Introverts have a talent for empathy because most of their attention resides in their heads. 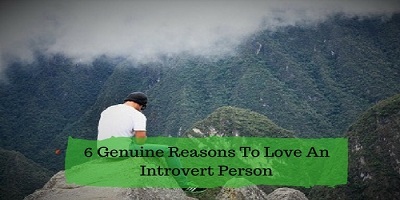 Introverts find themselves able to connect at a deeper level quite easier than most. They can read others easily especially if they know you well and will feel your emotions as if they're their own. Without having to try, they won't respond with judgment but they'll respond with understanding because they know what it's like to be misunderstood. In today's world introversion is usually seen as an act of rebellion by others. Introverts know who they are and aren't afraid to fight for it, they won't change to please others. In their eyes, it would only be a lie and an insult to you and themselves. Never try to give an introvert what you think they want to hear, what they want to hear is the truth. Introverts spend so much time in their own heads that they develop their own unique worldviews. Not all introverts will have the same worldview and usually, they express them through art music literature or all of the above. They'd rather express themselves creatively and passionately than converse, so prepare to be shocked at the things they can do. This will be the hardest to deal with in falling in love with an introvert. Introverts are quite valuable quite unusual and they rarely get the chance to shine maybe if you look around, you'll see one lounging in the background watching quietly with a smile on their face. Don't go up and try to force yourself on them just catch their eye across the room, smile if they return it and linger on you. If they just continue to glancing around, don't worry it's not personal they've just got about fifty tabs open in their heads. Who knows if you put in the time you could become one that's frequently visited.